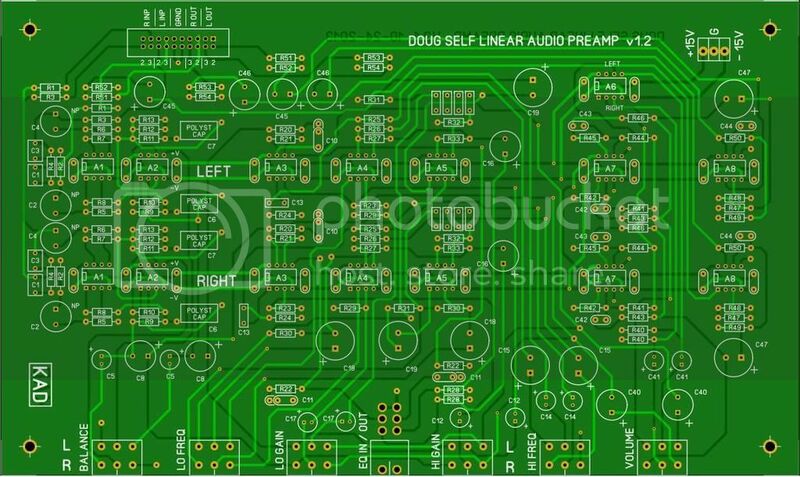 As promised here is a PCB and construction thread for the preamplifier as designed by Doug Self and published by Jan Didden in Linear Audio issue #5. Both gentlemen have graciously agreed to offer their support to guarantee success of this thread. This preamplifier is especially interesting in that it includes what Doug describes as a 'comprehensive tone control', that means that both the gain and frequency hinge points for the HIs and LOs are continuously user adjustable. For the last month I've been using this preamplifer listening to a variety of music and sources. Now that I have gotten used to having comprehensive tone controls at my fingertips I would miss them immensely if they were to disappear! Another quality of Doug's creation is that it's quiet, so quiet that I have given up attempting to measure it's noise level with my aging AP Portable One test set. Noise level at the outputs is at or near the noise threshold of my test set. Assuming there is sufficient interest I will offer up a kit of parts for builders amounting to the required IO and main PCBs, 6 potentiometers, 4 PCB mount RCA phono connectors, BOM and a PDF reprint of the Linear Audio article. The cost for a 2 channel kit will be $50 plus actual cost to ship. Private message me for details if you are interested. Last edited by Carl_Huff; 24th August 2017 at 11:53 PM. The IO PCB measures 260mm wide and 38mm deep. Note the addition of RCA phono connectors and delay ON circuit that was not in the published article. The IO was purposely separated from the main PCB so as to allow users freedom choosing a chassis for the project and to allow the further development of IO greater than the single pair shown here. The main PCB measures 260mm wide and 155mm deep. I am ready: where do I send the check!!!! It looks very nice. I may be interested. Last edited by Carl_Huff; 30th September 2015 at 08:43 PM. Reason: Argh ... typos! Here is a PIC of what I propose to be the front panel layout. The 'gold colored' circles are 15mm diameter control knobs. Note the centrally located toggle switch that when operated to the down position bypasses the tone controls. Last edited by Carl_Huff; 1st October 2015 at 04:54 AM. Last edited by Carl_Huff; 1st October 2015 at 04:37 PM. I am really looking forward to building this unit. At the moment the only additions I plan for the front panel are an on/off and an input selector. There is plenty of room on the layout in a standard chassis so it seems all systems are go. How many inputs are you looking for George?